We’d love your help. 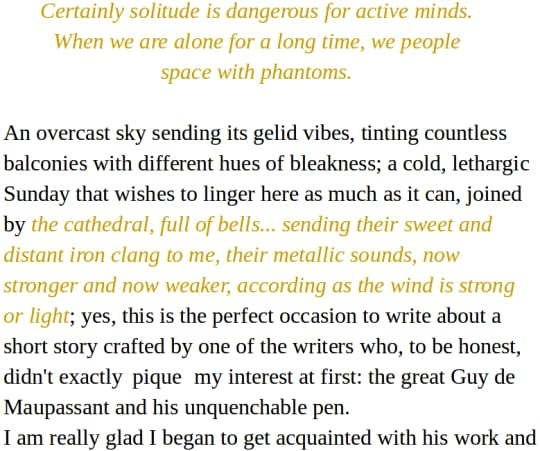 Let us know what’s wrong with this preview of The Horla by Guy de Maupassant. To ask other readers questions about The Horla, please sign up. I read this book, and can't exactly figure out what a horla is! what could they be? are they like Harry Potter's dementors? Vasil With respect to the answers depicting the entity as just the projected "outer self" of the protagonist, I consider this view rather one-sided. Lets…moreWith respect to the answers depicting the entity as just the projected "outer self" of the protagonist, I consider this view rather one-sided. Lets not forget that the protagonist does reflect on the nature of evolution, considering the entity to possibly be the next step in evolution. There's also a paragraph where he is wondering what kind of life forms might exist among the stars, which implies him regarding the entity as possibly of alien origin. A man thinks there is something haunting him in his home, something he can't see. Is it for real or just in his mind? * Also on my blog. Guy de Maupassant (a quien admiro, realmente), escribió más de 300 cuentos y no acostumbraba a encasillarse en un género, más allá de ser un protegido de Zolá y Flaubert y un alto exponente del realismo y del naturalismo, tenía una técnica brillante para elaborar sus cuentos. "El Horla", un cuento sobre la locura, es tal vez el mejor que escribió y tiene para mí, connotaciones autobiográficas y también es un juego sutil y macabro en la que se establece la temática del doble, tan particular en la Guy de Maupassant (a quien admiro, realmente), escribió más de 300 cuentos y no acostumbraba a encasillarse en un género, más allá de ser un protegido de Zolá y Flaubert y un alto exponente del realismo y del naturalismo, tenía una técnica brillante para elaborar sus cuentos. "El Horla", un cuento sobre la locura, es tal vez el mejor que escribió y tiene para mí, connotaciones autobiográficas y también es un juego sutil y macabro en la que se establece la temática del doble, tan particular en la literatura. Maupassant era un talento para este tipo de relatos, ya que él sufrió un proceso de este tipo en carne propia. No olvidemos que ya en su deterioro psicólogico, intentó degollarse tres veces, aunque no tuvo el valor de hacerlo y murió sumido en la demencia. I have read The Horla in French since I believe that semantic losses are inevitable in Translation. So if you can read it in its source language (SL) rather than in English —or any other target language (TL), then please do it. 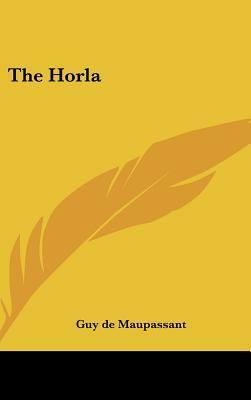 The Horla is a short horror story written by the prolific French writer Guy de Maupassant. It was originally published as “Letter from a Madman” in 1885. It was then revised and published again as “The Horla” in the newspaper Gil Blas in 1886. The Horlaunderwent a third revision before its final publication in May 1887. The Horla is considered as a portmanteau of the French words “hors” —and “là” (meaning “outside”—and “there” respectively). The Horla is said to have influenced H.P. Lovecraft’s The Call of Cthulhu. Narrated in the first person as a series of entries to an intimate diary, The Horla tells the story of an upper-class man, who becomes engulfed by troubled thoughts—and hallucinations. After having impulsively waved to a Brazilian vessel, this unnamed narrator starts experiencing a series of occult events that foster his descent into madness. In the days that follow the sight of the vessel, the narrator finds himself seized by a strange sense of malaise that intensifies at night. The local doctor fails to find a physical —and concrete reason for his patient’s malady. The narrator’s misfortune worsens when an invisible force tries to strangle him during his sleep on several occasions. Determined to put an end to this mystifying situation, the protagonist decides to leave his home country in order to spend a few days at Mont Saint-Michel. Much to his surprise, all his troubles vanish in toto. Unfortunately, he finds himself back to square one as soon as he returns back home. Little does he know that he had unwittingly invited an invisible creature —the Horla—that will haunt him until the end of times. Most of Maupassant’s works focused on the realism of war and its effect on the innocent civilians. However, The Horla differs considerably from his other stories, as it is a refined combination of realism —and horror. This tale is quite reminiscent of Edgar Allan Poe’s short stories due to the eerie atmosphere that prevails in it. A comparison between the Horla —and Maupassant’s life shows that this short story is actually a depiction of the author’s life. The subjectivity of Maupassant can be felt by the reader, while delving into this semi- autobiography. In his later years, Maupassant suffered from syphilis. This disease had deeply affected him —and rendered him paranoid. Following his attempt to commit suicide by cutting his own throat, the French writer was admitted to the private asylum of Esprit Blanche—where he spent the rest of his days. It was probably Maupassant’s psychological state that had prompted him to produce such a disturbing —and macabre short story. The resemblance between the protagonist and Maupassant is flagrant. It is through this work that the French author questions his own sanity. The Horla explores a myriad of themes linked to existentialism —and the frailty of Man. Some of the themes that were integrated in this short story are: the fear of the unknown, the deceptiveness of senses, Man’s irrationality, absence of free-will & critical thinking, national rulers & indoctrination, etc. This short story is very rich in terms of content —and also very deep. It is full to the brim with symbolism (e.g. the white vessel that reminds the reader of the whitewashed monastery in Herman Melville's Benito Cereno. In these two works, we have an allusion to madness)—and can be interpreted in various ways. 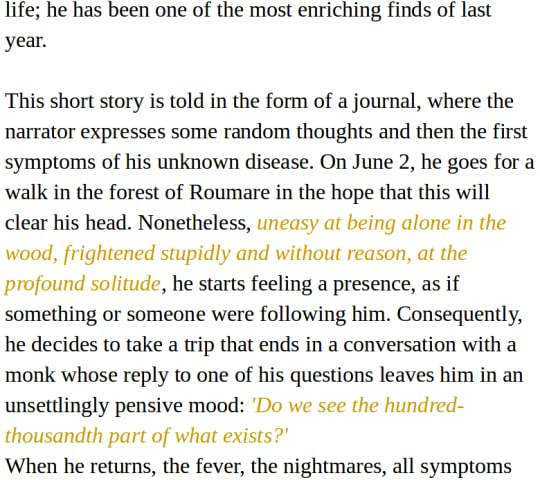 From the protagonist' inability to perceive his own reflection in the mirror to his final decision (view spoiler)[(he committed suicide in order to liberate himself from his fardel —and the mental torment) (hide spoiler)], every single detail seems to mirror Maupassant's desperation —and his declining health. I highly recommend it to everyone—and I hope you will enjoy it as much as I did. I literally loved every line. P.S: I will update this reveiw as soon as possible. “..La solitude est dangereuse pour les intelligences qui travaillent, Il nous faut autour de nous, des hommes qui pensent et qui parlent.Quand nous sommes seuls longtemps,nous peuplons le vide de fantomes.."
Published 1887 - THE HORLA - takes the reader on a journey into madness. Something is following the man around day and night, something he must capture and destroy....at all costs. Set near Rouen, France - May 8 - at first the man in the big country house is not well....is in horrible agony. "Am I mad?" "I must be going mad." The doctor proclaims him well, but he questions the hallucinations, the mysterious incidents in his room at night. Sometimes - the man takes short trips, but by - August 14 - even a simple carriage ride is impossible; he tries to get away, but the phantom that is watching him does not allow it. The creature continually haunts him. "Someone possesses my soul and governs it." Then- "I shall kill him." September 10 - He calls for a blacksmith. A dangerous plan is set to capture the thing that possesses him....he tells not even the servants. Now - the terror is over, but is it dead? THE HORLA is a short psychological horror story told in first person narrative with almost daily journal type entries beginning on May 8 and ending September 10 that demonstrate the relentless fear of the tortured man in the big house. Este breve cuento de Maupassant que pasó por varias correcciones viene a ser un relato espeluznante que más que miedo suele ocasionar angustia del lado del que narra sus terribles vivencias con "El Horla". Contada a manera de diario o como novela epistolar el personaje en primera persona es un hombre acomodado de París que empieza a tener impresiones muy extrañas con desapariciones de objetos durante las noches en que él duerme. Sólo conocemos su punto de vista durante toda la historia lo que ca Este breve cuento de Maupassant que pasó por varias correcciones viene a ser un relato espeluznante que más que miedo suele ocasionar angustia del lado del que narra sus terribles vivencias con "El Horla". Contada a manera de diario o como novela epistolar el personaje en primera persona es un hombre acomodado de París que empieza a tener impresiones muy extrañas con desapariciones de objetos durante las noches en que él duerme. Sólo conocemos su punto de vista durante toda la historia lo que causa que la sensación de no saber a ciencia cierta qué está pasando haga más angustiante el proceso de lectura. Nos cuenta cómo a veces sus empleados lo ayudan o lo secundan pero no sus pensamientos. El final en sí es un poco extraño, aunque se brinda una "explicación racional" hasta cierto punto tampoco puede ser del todo creíble al ser narrada por el mismo personaje y en vista de la conclusión final de este relato. I first heard of Guy de Maupassant after hearing "The Necklace"on Old Time Radio years ago, I have not read this yet but after hearing "The Horla" lately on OTR, I decided on reading this and comparing. After reading this story, I had listened again to both radio versions, The Weird Circle and Mystery in the Air. Both interesting but Peter Lorre's version which is the latter is pretty close to Maupassant's short story. When looking up the book mentioned in this story of ancient unknowns, I found I first heard of Guy de Maupassant after hearing "The Necklace"on Old Time Radio years ago, I have not read this yet but after hearing "The Horla" lately on OTR, I decided on reading this and comparing. After reading this story, I had listened again to both radio versions, The Weird Circle and Mystery in the Air. Both interesting but Peter Lorre's version which is the latter is pretty close to Maupassant's short story. When looking up the book mentioned in this story of ancient unknowns, I found out not about the book but that about 5 years after writing this, Maupassant had attempted to kill himself which brought him to an asylum. He died a year later. Reading this story and thinking about his suicide attempt makes you wonder about his feeling while writing this story. I found his relationship or like a guardianship with Gustave Flaubert interesting and that opened him up to other famous authors. When you start to read this journal of a man who slowly loses his senses and ability to control his actions, you come away wondering if he was really stalked by this invisible being or not. To me it seemed quite evident he was insane but then thinking of other happenings of what other servants went through, I wonder and I am no longer so positive. What is horrifying is the ending which I will comment on in the end, my spoiler section. I did not read this edition but from a collection from Delphi of his short stories, if interested in highlights and notes are located there. Look on my Guy de Mauspassant shelf. This story has an Edgar Allen Poe, "The Fall of the House of Usher" feeling but quite different. I will surely read Mauspassant again for sure. Existen al menos dos versiones de este cuento y son bastante diferentes en el formato, más que en el argumento. Digo “al menos” porque se considera que el cuento "Carta de un loco" es, en realidad, la primera versión de las otras dos (ay, qué lío). Existen varias similitudes entre los tres cuentos, porque todos tienen como protagonista a un demente que percibe una presencia. Como también leí "Carta…", me pareció bien hacerle un espacio y comentarlo muy brevemente. "Carta de un loco" (1885, serí Existen al menos dos versiones de este cuento y son bastante diferentes en el formato, más que en el argumento. Digo “al menos” porque se considera que el cuento "Carta de un loco" es, en realidad, la primera versión de las otras dos (ay, qué lío). Existen varias similitudes entre los tres cuentos, porque todos tienen como protagonista a un demente que percibe una presencia. Como también leí "Carta…", me pareció bien hacerle un espacio y comentarlo muy brevemente. "Carta de un loco" (1885, sería la primerísima versión): Tal como dice el título, es la carta de un paciente a su médico. Tiene un inicio muy lento en donde se desarrolla toda una teoría sobre el hombre y el conocimiento del mundo exterior, pero con determinado fin. Si bien el elemento sobrenatural está, no se desarrolla tanto como en las supuestas versiones que le siguen. De todas formas, es bastante contundente. En la versión publicada en 1886, el doctor Marrande, un psiquiatra, reúne a varios colegas para que escuchen el relato de uno de sus pacientes. Este hombre no se identifica, pero sí cuenta que goza de una buena situación económica (no es un detalle menor en esa época). Un día, empieza a sentirse debilitado y nervioso, a tal punto que consulta un médico. Hay algo que lo está consumiendo, algo que se le acerca y lo atormenta con extrañas manifestaciones. Breve y con dos narradores, este cuento es efectista. Tal vez hubiera querido más precisiones porque lo que plantea es interesantísimo y se queda a mitad de camino. Sin embargo, te deja pensando. En cambio, en la segunda versión (la definitiva y la que más se publica) no hay un doctor que presente el caso, sino un hombre que directamente registra sus experiencias en un diario que se vuelve cada vez más precipitado a medida que se hunde en la locura. La trama es la misma, pero hay varias escenas agregadas y una introspección mucho más fuerte del personaje, quien no me gusta en ninguna de las versiones. El final es seco, bien a lo Maupassant, así que se puede amar u odiar. Yo me inclino a lo primero porque ese recurso me encanta si está bien usado (y Maupassant es un maestro). Lamentablemente, sigo queriendo que este cuento sea una novela, con un desarrollo más lento de los acontecimientos. Imposible, lo sé. Me gustaron los tres textos, pero siento que lo mejor de Maupassant todavía no lo leí (con todo lo que escribió, es imposible elegir un favorito antes de tiempo). Sin embargo, “El Horla” me parece muy recomendable, sobre todo por la relación que tiene con la época en que fue escrito, además de la vida del autor. A man is haunted by "something" in his room. The Horla is the creepy being tormenting him and there seems to be no way to stop it. This is one of my favorite stories on this subject. "Quand nous sommes seuls, nous peuplons le vide de fantômes." A classic horror tale of an ageless, possibly immortal, invisible, vampire and known as the Horla! The audiobook narration by Dermot Kerrigan added a chilling ambience to this story. I listened to the audio first, and followed up by reading through the print. It would have been a different experience if I'd flipped the two, because once I hit halfway I definitely wanted to "skip to the end." I almost always feel that way about horror stories, though. So much time and energy spent on describing something atmospheric or suspenseful and I just want to get on with it. That may say more about me than about the story. As horror stories go (this is grouped with ghost stories, but t I listened to the audio first, and followed up by reading through the print. It would have been a different experience if I'd flipped the two, because once I hit halfway I definitely wanted to "skip to the end." I almost always feel that way about horror stories, though. So much time and energy spent on describing something atmospheric or suspenseful and I just want to get on with it. That may say more about me than about the story. As horror stories go (this is grouped with ghost stories, but to me it is more horror), the (view spoiler)[part at the end where he realizes he has just killed all the people who work for him, burned them alive, actually, that was pretty drastic. Horrifying, scary, ugh. (hide spoiler)] This was my first Guy de Maupassant, although I hear he is important. 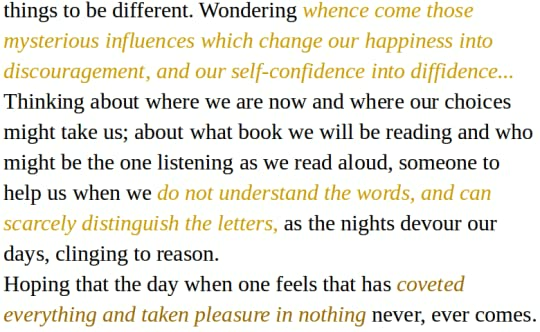 "Whence do these mysterious influences come, which change our happiness into discouragement, and our self-confidence into diffidence?" "Do we see the hundred thousandth part of what exists?" This is a repeated theme in the short story, and one that I remember hearing a lot growing up. "Certainly solitude is dangerous for active minds. We require men who can think and can talk around us. When we are alone for a long time we people space with phantoms." "We are terribly under the influence of our surroundings." It is puzzling why the narrator of the story keeps returning to his oppressive home, especially after (view spoiler)[his staff suffers the same as he does (hide spoiler)]. "He does not show himself any more, but I feel that he is near me, watching me, looking at me, penetrating me, dominating me, and more redoubtable when he hides himself..."
Entre raison et folie, Maupassant nous fait vraiment entrer dans la tête du héros qui maintient le doute sur l'existence réelle du Horla. Il est primordial de rappeler qu'il a écrit cette nouvelle à une période de sa vie où la folie commencée à l'emporter déjà. Le style d'écriture est captivant, d'une grande originalité. This review has been hidden because it contains spoilers. To view it, click here. this story was ok, I liked The Inn better. but I don't think there was really a ghost or vampire haunting this guy. I think he had some mental issues. and I'm sure that is absolutely terrifying in itself but I'm just saying I don't think it was an external haunting. Un loco que no es tal loco. “The Horla” by Guy de Maupassant is an early example of psychological horror and prefigured the weird fiction movement of the 1920s and 1930s in the United States. A man of science and reason, using those tools, slowly becomes convinced that he is being haunted by some sort of ghost. As the story moves on, the man becomes more and more unstable and unreliable as a narrator. Meanwhile, it also becomes evident that the things which is oppressing him (if it even is real), is not supernatural at all. 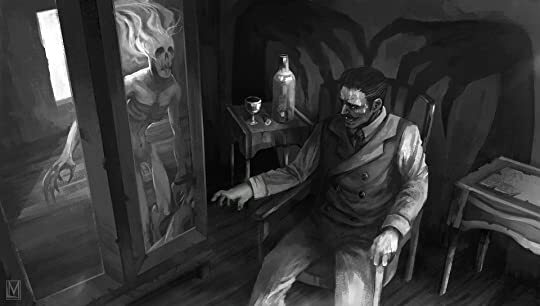 “The Horla” by Guy de Maupassant is an early example of psychological horror and prefigured the weird fiction movement of the 1920s and 1930s in the United States. A man of science and reason, using those tools, slowly becomes convinced that he is being haunted by some sort of ghost. As the story moves on, the man becomes more and more unstable and unreliable as a narrator. Meanwhile, it also becomes evident that the things which is oppressing him (if it even is real), is not supernatural at all. It is rather preternatural and probably destined to rule our kind without care or feeling for us. C’est l’histoire d’un homme qui prend note dans son journal intime de l’évolution de sa maladie psychiatrique, il se rend compte qu’il devient fou. Il nous raconte la peur qui augmente, au jour le jour. Il s’imagine qu’il a un double de soi, Le Horla, qui fait tout pour remplacer son âme, saine a l’origine, avec l’âme malade. Pour finir il succombe, mais essaie de prendre son double au piège dans sa maison, qu’il incendie, pour le détruire. Il n’est pas sure que son double n’est pas indissociable de lui-même. La mort de l’un n’entrainera pas la mort de l’autre. Un chef d’œuvre en originalité et en qualité d’écriture. Maybe Guy de Maupassant is my greatest discovery this year! Une bonne relecture ! Maupassant parvient avec brio à nous relater la lente descente aux enfers d'un homme (lui ?) vers la folie. L'ambiance est oppressante et l'emploi du "je" ainsi que la forme de journal intime nous met dans la tête du personnage principal. Résultats ? Malaise et questionnement. On veut sortir de "son" corps tout en voulant en savoir plus. Redoutable mais efficace ! Old-school horror story. It reminds me of 'The Double' by Dostoevsky. Terror psicológico, suspense y una espeluznante reflexión sobre la imperfección humana. Desde hace bastante tiempo tenía ganas de leer algo de Maupassant pero no se me había presentado la oportunidad y ahora que pude hacerlo no puedo negar que lo disfruté. Una historia dedicada a la desesperación humana con toques sobrenaturales, que te pone a pensar en qué o quién está detrás de esta extraña situación. Great collection of one of my favorite stories (this edition has two previous versions Maupassant composed from different points of view, before settling on the final text) - it's interesting how the new understandings opened up by the sciences at the time (19th century - the actual scale of natural processes and our small scope in them and ability to understand them) can be interpreted by some in the culture as positive, while others like de Maupassant ("The Horla"), Ambrose Bierce ("The Damned Great collection of one of my favorite stories (this edition has two previous versions Maupassant composed from different points of view, before settling on the final text) - it's interesting how the new understandings opened up by the sciences at the time (19th century - the actual scale of natural processes and our small scope in them and ability to understand them) can be interpreted by some in the culture as positive, while others like de Maupassant ("The Horla"), Ambrose Bierce ("The Damned Thing") and Fitz James O'Brien ("What Was It?") can use that understanding as a source of overwhelming horror. I guess it was all part of mankind's mind re-ordering itself into the new systems that science exposed - sometimes it seems hopeful, other times despairing as the old system cracks and rots away. Here then, in nascent form, is the source for Lovecraft's "cosmic horror" of some decades later. So many things are packed into this story, one can feel an educated man swamped by the implications of his times. Optics, neurology, evolution, brain research, astronomy, mesmerism, mental illness, all combine to make up the "Horla" - the thing from "out there" that moves around us, is inimical to our lives and can't be stopped because we are blind to it even when we know its existence - a stand-in for the processes of science, nature and the mind. I'll even be cheeky and suggest that the "Horla" might be seen as a prototypical version of an idea that later coalesces in the figure of Fantomas, French arch-criminal mastermind and master of disguise whose existence is only guessed by his nemesis Juve after piecing together seemingly random and disparate clues, the outlines of which point to his existence. 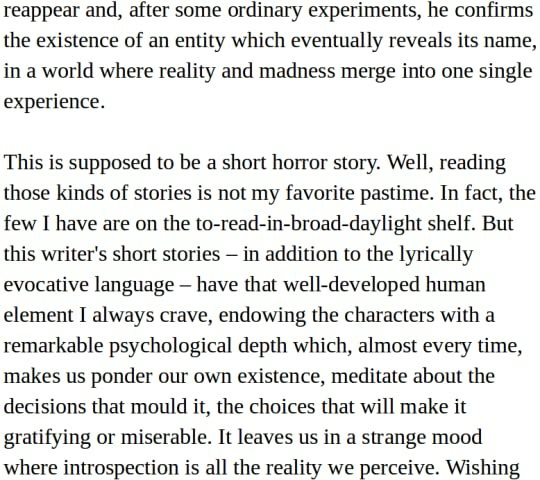 And I still contend the last line of the story (admittedly, translated in a slightly less powerful, if I assume more grammatically correct form, in this translation) is one of the greatest ever for a horror story, the inescapable summation of the logical mind running headfirst into madness. I am a big Guy de Maupassant fan, this was nowhere near what I expected. A haunting, psychological horror story of a descent into madness. Really well done by MHP too with an earlier version and some notes. Just a pleasant surprise.